– No Need to Feel Isolated Any Longer! 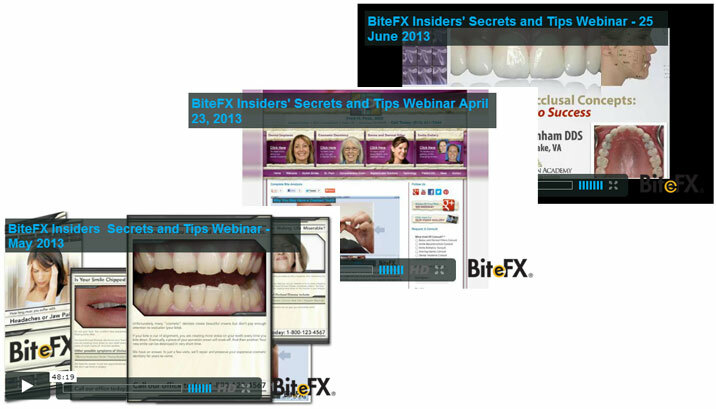 As a member of the BiteFX Platinum Insiders' Circle you will be able to enjoy and learn from our monthly Insiders' Secrets and Tips webinars. In these webinars you have the opportunity to join with other occlusion-focused dentists and thought leaders as they share their tips and knowledge of what is working best for them today. BiteFX News – so you always know what's available to you in the software, animations, marketing tools, partner product and events. Dental Expert – each month we feature a leading dentist sharing expertise relevant to occlusion-focused dentists like you. How Proper Implant Training Exploded My Practice! All Platinum Insiders' Circle members gain access to the recordings of past webinars so you gain a great wealth of information the moment you sign-up!